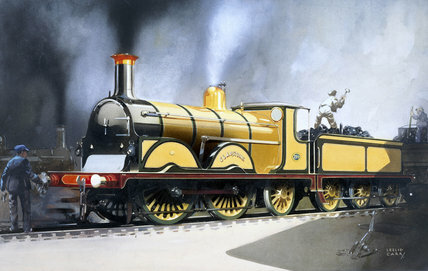 Watercolour by Leslie Carr, showing the London, Brighton & South Coast Railway (LB&SCR) 0-4-2 steam locomotive no 214 'Gladstone', which was the prototype of the B1 clas locomotive and a development of the Richmond clas. Designed by locomotive engineer William Stroudley (1833-1889), Gladstone was built in 1882 and was withdrawn from service in 1927. Leslie Carr designed posters for the Southern Railway, London & North Eastern Railway and British Railways in the 1920s and 1930s. 'Old Gateway, Bruges', SR poster, 1928. 'Historic Romantic Exeter', GWR poster, 1923-1947. 'Southampton Docks: the Gateway to the World', SR poster, 1931. 'Southampton Docks', SR poster, 1936.